The summit and center of Gemma’s prayer life was certainly the holy Mass and Eucharist, which she attended to early each morning. She often spent part of the night praying and anxiously awaiting to receive Jesus in Holy Communion. On awaking, Gemma, all but indifferent to her appearance, would hurriedly get dressed in the morning, quickly affixing her hair in a zig-zag part, her thoughts focused only on her meeting with Jesus in Holy Communion at the Mass. Within five or so minutes from arising, she would be found standing quietly at the door, wearing her usual long black dress and mantelette, waiting for Ms. Cecilia, so as to go to Church together. Father Germanus writes "In the morning, at the break of day, already beside herself with joy, she jumped out of bed, dressed in a few minutes and was ready to go to Church....I was moved to tears, at seeing Gemma with her hat on, absorbed in thought, waiting at the door of her companions room. "To see her", her companion [Cecilia] writes, "she seemed each morning as if she were getting herself ready for her nuptials, or as she herself put it- 'to go to the feast of the love of Jesus'. 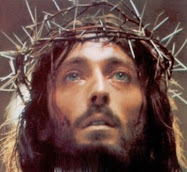 And another time ‘Oh, what immense joy and happiness my heart feels before Jesus in the Blessed Sacrament!...Jesus, soul of my soul, my Paradise, holy Victim…behold, I am all Yours! I felt that You were seeking me and I ran to You! 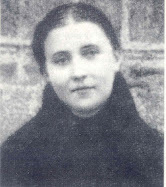 Gemma once called the Eucharist “the school of Paradise, where one learns how to love..” and continuing with this she said “the school is the supper room, Jesus is the Master, and the doctrines are His Flesh and Blood.” In his book “The Life of St Gemma Galgani, her spiritual director, Venerable Father Gemano Ruoppolo CP devotes an entire Chapter (cf. Chapter 25) to Gemma’s devotion to the Blessed Sacrament. Page after page is filled with examples such as I have written above. Suffice it to say that the Mass and the Eucharist was at the heart of her devotion and prayer. "Mr. Lorenzo gave me some accounts to tally for him, and as they were rather difficult, I applied such attention to them that I lost sight of God. Father, you see here how imperfect I am. Because of a few figures and a material interest, I left Our Lord. This thought disturbed me greatly for a short time. I asked God to par­don me, and He did so at once." Father Germanus continues – “It was enough to see this girl even at a distance, in order to be convinced that she was absorbed in God. Her dignity of counte­nance, gravity of bearing and moderation of words; her angelic modesty beautified by a spontaneous smile that always played around her lips. All went to show the beholder that Gemma was only in body a dweller in this world. This uninterrupted attention to heavenly things had become so natural to her, that she would have had to do herself violence to think of anything else. Finding myself one day at table with the family, who are benefactors to our Institute [Passionist Community –ed. ], on seeing Gemma, who was sitting opposite me, all absorbed in God, I used my authority as her spiritual Father and told her to distract herself, that being at table was not the time or place for prayer. At my words I saw that she turned pale and seemed to tremble all over. She continued to eat as if her manifest mental suffering was nothing. After dinner, calling her aside I saw that she was perspiring profusely. "Now what is this?" I said to her, won­dering. "You know what, Father," she answered with her usual can­dor. "Oh, did you not take Jesus from me at table? And can I live without thinking of Him?" I changed the subject, and with an air of reproof sent her to change her clothes. In about an hour I renewed the precept and the strange phenomenon repeated itself. Once again I renewed the same precept with the same result. After this I left her free, as it pained me greatly to see how much suffering my prohibitions caused her. “Thus she occupied twenty-four hours of her day. I say twenty-four hours, because taking as she did very little sleep and at short intervals, her prayer was scarcely interrupted. On awakening she immedi­ately took it up where she had left off. She rose from bed without weariness or mental heaviness, and whoever might be present as she got up would have seen her sign herself devoutly with the crucifix that she always kept in her hand while sleeping, kiss it and then smile with heavenly grace. Making allusion to her noc­turnal interviews with her Lord, she was once, when in ecstasy, heard to exclaim: "See, oh Jesus, even at night, those hours, those hours! I sleep, but Jesus, my heart does not sleep. It watches with Thee at all hours." Thus, by talking to God throughout the day, we see that Gemma kept herself continually united with God. Thank you so much Glenn for this wonderful post on Gemma anticipating Communion. I am so glad to hear that you liked this article and were inspired by it. Believe me, I too was inspired by it when I was putting it together. I too love to read the lives of the Saints. And, it is God who is glorified in His Saints, and it is He who holds them up for us to imitate and emulate. And this is why I have this saying on the St Gemma homepage "
"All Your works shall give thanks to Thee, oh Lord, and all Your Saints shall bless Thee. Your friends make known, oh Lord, the glorious splendor of Your Kingdom." 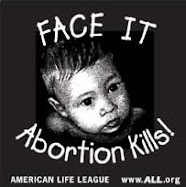 (Psalm 145). God's "friends" are the Saints, and they lead us to Jesus, and that is why we venerate and love them. They teach us how to love Him. 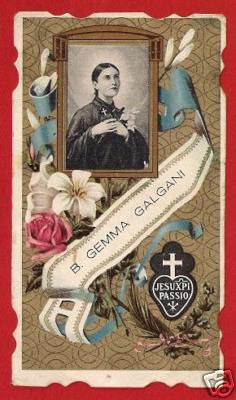 And for me, my favorite saint is Gemma, because not only did she love Jesus with all her heart, she expressed her love for Him so well in her writings. Thanks again for you kind comments. I am falling in love with this saint. 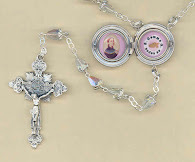 I am now entreating her and St. Joseph for the conversion of my relatives. She is such a good role model; I hope that I can imitate her and grow in love for Jesus and Mary. St. Gemma, pray for us!